Long time ally of Rock Beyond Belief, Chris Rodda, is in the middle of a press storm again. She is the author of Liars For Jesus , which explains the relatively recent phenomenon of history revisionism in the name of Christianity. David Barton is the worst offender, and bears the brunt of the majority of her assault. He is guilty of quote-mining and using out of context historical references, or shockingly just outright lies about our nation’s history. He wants Americans to ‘know’ that the nation was founded on Christianity. He is able to find several obscure and often second-hand references to the founder’s private letters, sometimes with single sentences that suit his needs. This is of course while he leads his readers along in Olympic-level mental gymnastics, overlooking the mountain of documentation contrary to his version of history. Last week, an admittedly uneducated ‘historian’, David Barton was on the Daily Show with Jon Stewart. Weeks ago, prominent Christian right-winger Mike Huckabee joked about forcing Americans at gun point to learn from him. Glenn “Too crazy for Fox News” Beck has placed Barton in a prominent spot in his ‘university’. Sadly, my home state of Texas has used him as an expert for re-writing the text-books. It will take years, possibly decades to undo the damage done to public education. 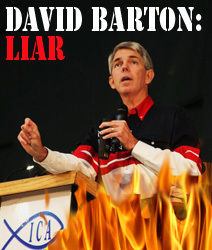 David Barton wants your kids to believe that America was founded on Christianity. It was submitted to the Senate by President John Adams, receiving ratification unanimously from the U.S. Senate on June 7, 1797 and signed by Adams, taking effect as the law of the land on June 10, 1797. In addition to writing books, and articles on Talk2Action and Huffington Post, she works at the Military Religious Freedom Foundation (MRFF), as Head of Research. MRFF is representing me and hundreds of other Soldiers in upcoming litigation partially stemming from the story I broke about the *mandatory* Spiritual Fitness testing and remedial training for all US Soldiers. So, I’ve had about 6 months to grow a pretty close friendship with her. I know her to be sharp-witted and possessing an unreal ability to pay attention to detail. I’m not surprised to see her book about the situation jumping back onto the radar. It is spot on. The inexplicably successful disinformation tactics Barton employs are put to shame in Rodda’s book, Liars For Jesus. But with this particular round of resurgent publicity, Chris Rodda had an epiphany. You can now download her book, Liars for Jesus (PDF), for free. A few hours ago, I was about to sit down at my computer to do my usual thing — write about the Daily Show interview, and debunk the specific lies that Barton was able to get in. But instead I found myself staring at the big Ben Franklin poster on my wall, and changed my mind. Sure, I could write about the particular snippets of disinformation and dishonesty that spewed forth from Barton during this particular interview, but what good would that do? Been there; done that. Then, staring up at the face of Ben Franklin, it was his words, “Do well by doing good,” that suddenly popped into my head. “Do well by doing good” — the words of a man who could have become outrageously wealthy by patenting his inventions, but decided to just let everybody have them for the public good — have now been stuck in my head for hours, and aren’t going to leave until I do what I’m about to do — give my book away for free. Can I afford to do this? No. Do I need to do this? Yes! Will lots of people download it and read it? I have no freakin’ idea. It’s just what I need to do to bee able to look Ben Franklin in the eye on that poster on my wall.